We've opened a new showhome at our Yate development As a result of the popularity of our development in Yate, Amberley, a new showhome has been opened to give visitors the opportunity to see a different home style as it would be for family living. The regeneration of former Springbank shopping centre in Cheltenham has been hailed by local VIPs after a recent visit. New homes go on sale at our development Barbican Walk, Barnstaple We have opened Barbican Walk, a 21-home exclusively private development within walking distance of Barnstaple town centre. 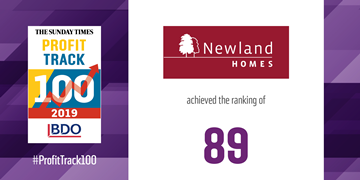 The Sunday Times BDO Profit Track 100 has ranked us number 89 in its annual ranking of Britain's private companies with the fastest growing profitability. Frome housing development shortlisted for Best in the South West award Our development, The Old Nurseries in Frome, has been shortlisted for the title of Best High Volume New Housing Development at the South West LABC Building Excellence Awards.